Whether it's a large sheet of labels on printer paper or individual labels in a perforated roll, removing those labels from their backing paper can sometimes be frustrating. Some labels are cut to the edges of the backing paper and it can be difficult to get a finger in between the label and the paper. Other times the labels roll into a cylinder as you peel it off and end up sticking to themselves. Hold the label in both hands and bend it away from you like a rainbow. Slip your thumbnails under the lower corners of the label, in between the sticky backing of the label and the backing paper. Release one hand from holding the label and use it to further peel the label away from the backing. Use a credit card, tweezers or butter knife to get the label off of the backing paper. Hold the label with one hand and the card in your other hand. 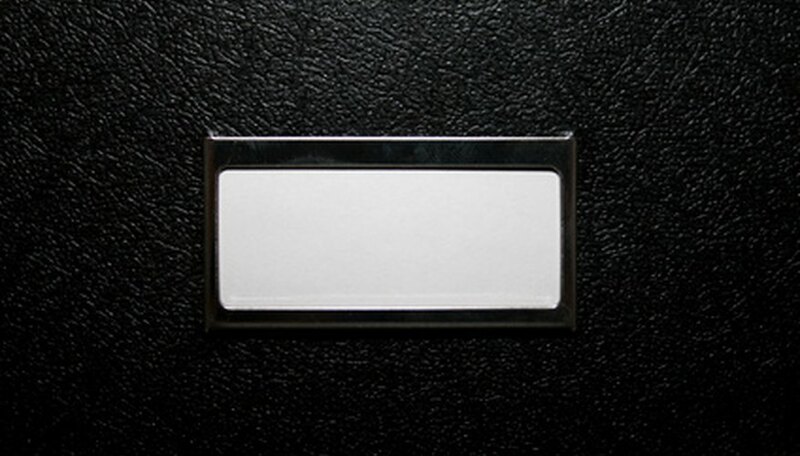 Wriggle the credit card into a corner space between the label and the backing paper. The corner of the label will stick to the credit card. Hold the backing paper with one hand and pull the credit card away from the backing paper with your other hand, taking the label with the card. Steam the label off of the backing paper. Use a pair of tongs to hold the label with the backing paper facing down over a boiling pot of water. Start by steaming the label for 15 to 20 seconds, and then test the effectiveness of that time frame by peeling at the corner of the label. If it's still stuck, steam it again for 15 to 20 second intervals until the label comes away from the backing paper.